For those of you who don't realize it or are new to the wonderful world of wine, Sangiovese is the primary grape varietal used in Chianti. 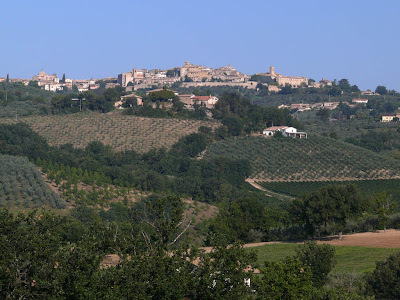 There is no "Chianti" grape, rather they are a Sangiovese-based blend following the Italian guidelines needed to call a wine "Chianti." That is not to say that every Sangiovese blend is a Chianti. For example, this wine, the 2007 Arnaldo-Caprai Montefalco Rosso. It is a Sangiovese blend comprised of 70% Sangiovese, 15% Sagrantino, and 15% Merlot (this wine is below the 80% Sangiovese needed to be technically called a Chianti). Being primarily Sangiovese, it shares a lot of similar characteristics with typical Chiantis, yet remains unique unto itself. The Sagrantino grapes in the Arnaldo-Caprai Montefalco Rosso are the main distinguishing factor in this wine. Sagrantino is a grape variety local to the Umbria Region of Italy, especially in the town of Montefalco and surrounding area (hence the wine's name). Sagrantino is a very earthy, dark grape which certainly lends something special to this wine even at only 15% of the total blend. 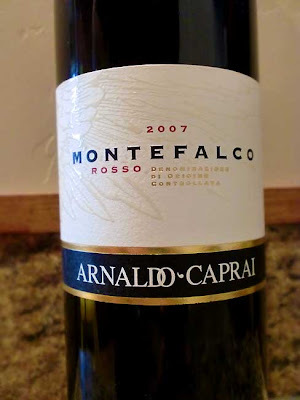 The 2007 Arnaldo-Caprai Montefalco Rosso pours a clean, ruby red. It has lively, bright aromas of black cherry, vanilla, and a faint smokiness. On the palette you get dark dry fruits and bittersweet chocolate, with an almost herbal finish. The body is soft-to-medium, yet the tannins are fairly strong, lingering, and wonderfully mouthcoating. This wine is surprisingly complex and rather impressive. I had it with homemade ragù served over penne pasta alongside crusty French bread and it went... perfectly. Other pairings according to the winery include red and white meats, cold cuts and matured cheeses. Drink This: if you want an authentic taste of the town of Montefalco, Italy. The Sagrantino grapes really give this wine some character. Don't Drink This: if you don't like dry red wines. But if you do, this wine is an excellent choice.